A number of scalar measurements which DVM automatically makes require knowledge of the actual switching frequency of the converter. In particular, the test objectives listed below measure the output voltage and current at the end of the simulation time. These in-regulation measurements require DVM to know the actual converter switching frequency and without this information, the in-regulation measurements are not made. 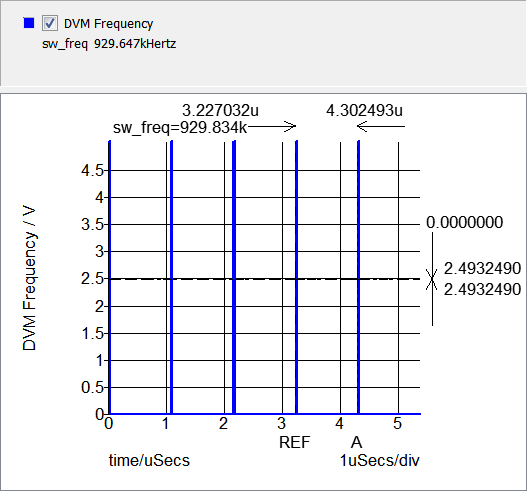 For this reason, a special curve name, DVM Frequency, has been reserved for DVM to find the switching frequency. The fixed probe measurement is executed after the simulation completes and annotates the graph with the actual frequency measured during the simulation. The curve legend is annotated with a measurement: sw_freq, and this measurement is output as a scalar value in the report. 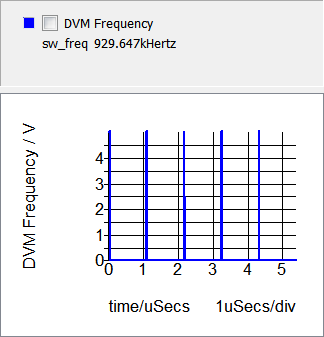 The frequency is measured over the last full switching period present in the simulation, taken from rising-edge to rising-edge of the DVM Frequency waveform. The cursors in the graph image below show the time interval over which the frequency is measured. Note: The discrepancy between the measured sw_freq in the header and in the graph is an artifact of the waveform viewer/cursor readout. The actual measurement operates on the vector data and always produces the correct results, which appear in the graph itself..